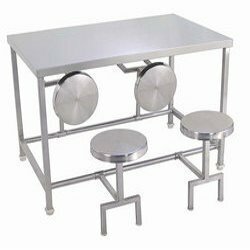 We hold expertise in providing a qualitative range of Dining Equipments like Bain Marie table top, chafing dish, dining table, dining table stand, water cooler and six seater dining tables. Our ranges of products are widely appreciated for their sturdy construction, reliable functionally, and maintenance-free features. These are widely used in clubs, food resorts, industrial canteens, hospitals, restaurants, hotels and banquet halls. Owing to its features like longer service life and fine finish they are highly demanded by customers. Our clients can avail from us high quality range of Dining Table Stand that is available in various sizes, shapes, designs and specifications. They are highly strong to carry the weight of food and plates. 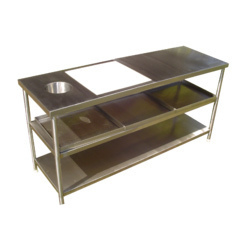 We manufacture these using advanced technology and highly durable stainless steel part. They have the salient features like functional accuracy, operational ease, high performance and corrosion resistance. Our ranges of these are applicable in clubs, food resorts, industrial canteens, hospitals and call centers. We supply these at market leading prices. 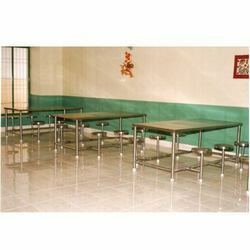 These SS Six Seater Dining Tables are used in restaurants, hotels, schools, colleges, hostels and banquet halls. Our ranges of products are well known for their excellent designs, durable finish standards and longer service life. They are available in various sizes and specifications. These are designed in accordance to the modern trends. They are highly demanded for their high tensile strength, dimensional accuracy and corrosion resistance. 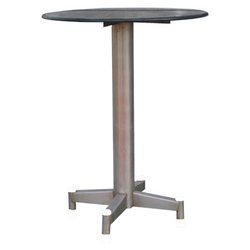 These tables are made of best quality and are highly efficient. With rich industry experience, we are manufacturing superior quality of Dining Table at reasonable prices for our clients. Clients can avail these products in different dimensions and are tested before dispatching to our clients. These products are also checked stringently by quality analysts to ensure that flawless range is supplied to our customers. They are well known for their features like fine finish, sturdy construction, resistance to corrosion and require less maintenance. We are the prominent manufacturers of a vast collection of Vegetable Cutting Table which are highly demanded at international standards. These tables are made with pure quality of materials and are highly appreciated for its durable nature. They can be easily used for cutting vegetables in an ordered manner. Our collection of these products is extensively used in various hotels and restaurants. These tables are light in weight yet sturdy and strong with portable design. Clients can avail these at competitive prices. Looking for Dining Equipment ?